There’s No Mirages in this Desert of Broken TVs and Computers. I remember the first time I arrived into Shanghai, China. I had never travelled overseas – let alone by myself, so imaginably I was equally anxious and nervous. It was about 2 am, I was jetlagged having travelled a 16 hour route, and all I wanted to do was get off this compact budget airline. Finally. After several hours the pilot, in broken Malay-English, announced we were arriving into Pudong Airport, Shanghai. I was fortunate enough to have a window seat, so I desperately searched for the world’s largest, most innovative city below me through the thick cloud. Suddenly the familiar bumping and bouncing of the plane’s wheels landing disturbed my concentration. Side-by-side image of the smog density in Shanghai. (Weisenthal, 2013). I couldn’t see anything. The city’s hazy smog blanketed the sky like a giant snow globe. For the following month I yearned to see the blue sky again. While I am on exchange in China this year, I’ll be a 4-hour drive from Guiyu, Guangdong. Guiyu has adopted the un-coveted title as one of the World’s most polluted towns. AMTA last year found that only 4% of the E-waste is correctly recycled (AMTA, 2015). 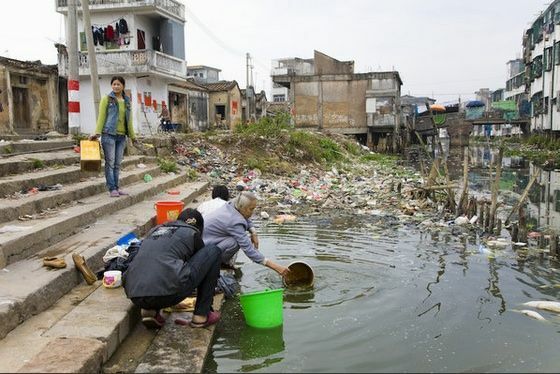 Guiyu, housing about 150,000 people, is just one of many areas in China that have become home to mass landfills and illegal recycling plants. In fact, of Guiyu’s twenty-eight villages, twenty are involved in the informal recycling of E-waste (Wang et. al, 2013, p. 22). This disastrous phenomena led to a UN Report released in December that determined Guiyu’s water and soil contained deadly levels of mercury, lead and other toxins (Baldé et. al, 2014). This is combined with the archaic methods local workers use of burning and acid baths to recover valuable metals such as gold, copper and silver that are worth €48 billion (Baldé et, al, 2014). Guiyu, Guandong, China. Broken circuit boards bank up along water sources (Amirthalingam, 2015). The issue of electronic waste is becoming exponentially worse each year. Considering both first-world and developing nations purchase and consistently replace their electronic goods, it’s no surprise that in UN report, it was declared that 41.8 million tonnes of electronic waste was generated that year (Jozuka, 2015). So how do we solve this devastating issue? It is possible that, considering the value of the wasted metals within the waste, various stake holders could be engaged and encouraged to uphold correct recycling methods and safety. Unfortunately for China, it has recognised that voluntary methods of electronic product recycling is not effective. As a result, China has implemented pilot methods of third-party e-waste recycling centres (Zhong & Schiller, 2014, p. 141). The process is in its early stages, but hopes to move to a national level soon. Unfortuantely, the millions of tonnes may keep building up. And when more than 90% of the world’s E-waste is not even recycled safely, detrimental damage to the environment not only in China but domestically will continue. AMTA 2015, ‘Toxic Australian e-waste dumped on China’, Australian Mobile Telecommunications Association, viewed 14 May 2015, <http://www.amta.org.au/pages/About.AMTA&gt;. Before and After – Shanghai, Weisenthal, J 2013, Business Insider, viewed 14 May 2015, <http://static.businessinsider.com/image/52a1aaddeab8ea056568f741/image.jpg&gt;. Jozuka, E 2015, ‘The World Produced a Staggering 41.8 Million Tonnes of E-Waste in 2014’, Vice: Motherboard, viewed 14 May 2015, <http://motherboard.vice.com/read/the-world-produced-a-staggering-418-million-tonnes-of-e-waste-in-2014&gt;. Wang, F, Ruediger, K, Alquist, D & Li, J 2013, ‘E-Waste In China: A Country Report’, StEP, United Nations University, April 5, viewed 14 May 2015, <http://collections.unu.edu/eserv/UNU:1624/ewaste-in-china.pdf&gt;. Zhong, H & Schiller, S 2013, ‘Exploring a third-party e-waste recycling system under the extended producer responsibility framework in China’ in Solving the e-waste problem: An interdisciplinary compilation of international e-waste research, StEP, United Nations University, viewed 14 May 2015, <http://www.step-initiative.org/files/step/_documents/edited%20Volume.pdf&gt;. It was really interesting to read your personal experience. Environmental damage due to e-waste is fast becoming one of the worlds largest issues. Like you said, while there are projects and plans in place, it does not seem enough to eradicate the problem completely. Overall great job!